All over the northern states, people drive through the back roads to bask in the glory of autumn leaves. From the Acadia National Park in Maine to mountain regions of the Appalachians, Ozarks, Ouachita and over to the Rocky Mountain National Park, the fall trees create a show for residents and visitors. New Mexico’s five national forests also sport a lot of fall foliage at varying elevations as do the mountains in Asheville, North Carolina that attract visitors from around the world. the summer, a tree thirstily pulls water up through the roots. The leaves soak up sunlight. The sun triggers the chlorophyll in the leaves. Green means chlorophyll, which is what makes food for the trees. Chlorophyll is like a sugar rush. In addition, the water, dew, rain and humidity plus the light of summer capture carbon dioxide from the air and create a phenomenon in the leaves called photosynthesis, which literally means, “Putting together with light.” Everything is green and verdant. In the fall, there is less sunlight and it gets darker earlier. Chlorophyll in the leaves dissipates. The orange hue comes from something we’re familiar with called carotene, which also makes pumpkins and sweet potatoes orange. Carotenes are antioxidants that protect the plant from free radicals, which are compounds that scientists believe may cause cancer in humans. Reds and purples are the result of a chemical called anthocyanin—glycoside pigments in plant cells that produce blue to red coloring in flowers and plants. Anthocyanin is a naturally developing sunscreen. When broken down into molecules, anthocyanin includes a sugar. This affects the carbohydrates within a plant and the color comes out. Since anthocyanin color changes with pH, the acidity in the soil and plenty of sunlight are necessary for the leaf color, too. Brown is from tannin, a substance found inherently in almost all plants, in all weather worldwide and particularly in roots, wood, bark and leaves. The brown color of trees such as the oak is made from wastes left in the leaves. When leaves turn, the photosynthesis stops and the green in the leaf begin to dry up and die. During this process, colors that were already in the leaves such as yellow and gold spring to life. If there is leftover sugar in the leaf, the hue becomes red or purple. Eventually the leaves run out of steam, the juice of color is gone and they turn brown and fall off the trees because the stems lose elasticity and become brittle. If a good wind comes along, the leaf breaks free and spirals in the air, doing a dance with the wind until it flutters to the ground. A Michigan State University Extension study claims that if trees that have been stressed by drought, or if there has been damage to the trunk from animals or perhaps it contracts a disease that reduces the water intake, these factors have a tendency to turn leaf color sooner or even go dormant for winter before the other more hearty trees. 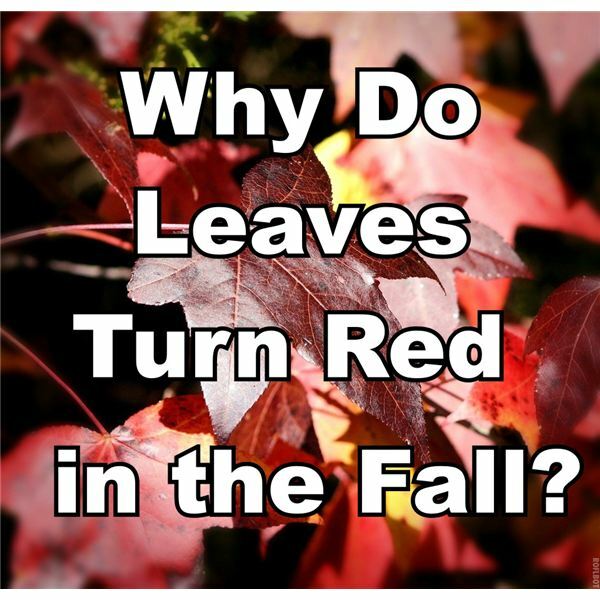 Emily M. Habinck discovered something in 2003 that put forward a new idea about why trees change colors. In the past, a plant physiologist named William Hoch of Montana State University proposed that the soil had a lot to do with fall colors. Hoch studied the sweet gum and red maple trees and surmised that the red pigments were, yes, a result of anthyocyanins, but if the tree lived in poor nutrient soil, it produced more anthocyanins to protect the leaves longer, recovering as many nutrients as possible before winter set in. This theory was further proved when Hoch found that if he genetically blocked anthocyanin, their leaves became unusually vulnerable to fall sunlight, sending fewer nutrients to the plant roots for winter storage. Soil analysis advanced the idea and satellite data compared tree color matched to geological maps and soil testing, so Hock’s original theory has proved to have more weight. The folks of Ashville, North Carolina have some tips for going to a popular location such as theirs. Make reservations early and choose Sunday through Thursday for your stay versus the weekend. Color starts from the highest elevation on down, so climb that mountain and don’t be bothered by fog—it will probably dissipate. Wear polarized sunglasses to enhance colors. Take picnics or snacks as the day might last longer than you think and restaurants are rare. Likewise, fill up with gas and bring a paper map—don’t count on GPS alone. For comfort, pack a sweater or jacket because temperatures often change with elevation or as the sun goes down. Have you seen the birch? It has white, shiny bark and in the light, shows off like silver. Its leaves typically go from green to gold to brown, and illuminate its jagged edges. Gingko trees have relatives that lived in prehistoric times and we might surmise that the dinosaurs feasted on their fan-shaped leaves. A sassafras tree sports leaves with several different shapes and while some look like spades, others grow into a mitten-shape. The star-shaped sweet gum trees have leaves of magnificent colors in fall—mostly yellow with brilliant red. The smoke tree is a showoff, the stalks of its flowers thin, fine and so delicate they appear like wisps of smoke from far away. Red oak leaves spread out like beautiful fingers. Honey locust leaves have long veins filled with lots of leaflets that resemble flattened coins. The pin cherry has narrow slender leaves with tiny jagged edges and the linden looks like Egyptian fans that were used to cool the pharaohs. Sassafras leaves resemble hockey gloves and the sourwood become paddles. Robbins, Ken. Autumn Leaves. New York: Scholastic Press, 1998. Book. Correlation of Soil Development and Landscape Position with Fall Leaf Colors, Newswise, Geological Society of America (GSA). October 2007. Paper. Bullar, Lisa. Leaves Fall Down: Learning about Autumn Leaves. Mankato, MN: Picture Window Books, 2011. Book.